Which trail/side of Mt Fuji is best to see the sunset and sunrise respectively? Thank you for your very informative site, Gary. Very much appreciated. About my question, I'm planning to do a day-climb next week to the summit in time to see the sunset, stay the night, wake up in time to see the sunrise, then descent down. Which trail/side of Mount Fuji should I take to best see the sunset from the summit & then the sunrise? A lot of sites say the Yoshida trail is best to see the sunrise, but no sites say which is best to see the sunset. Great question, Amin. If you arrive at the summit in time for the sunset, which trail you choose probably doesn't matter, since Mt. 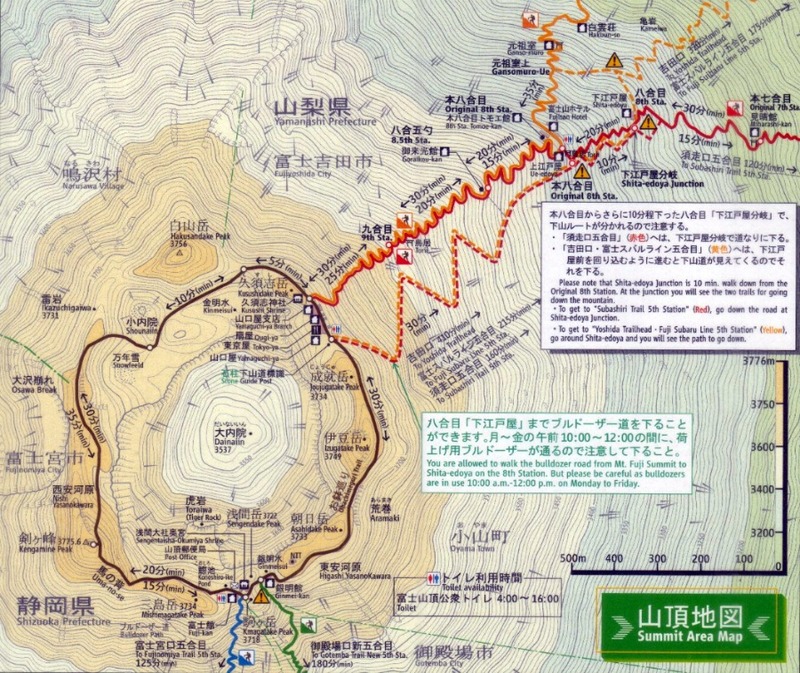 Fuji's summit cone is less than 1 km across and you can hike around it in only an hour and a half (http://garywolff.com/mt_fuji_trail_maps/ohachimeguri_trail_map.jpg). 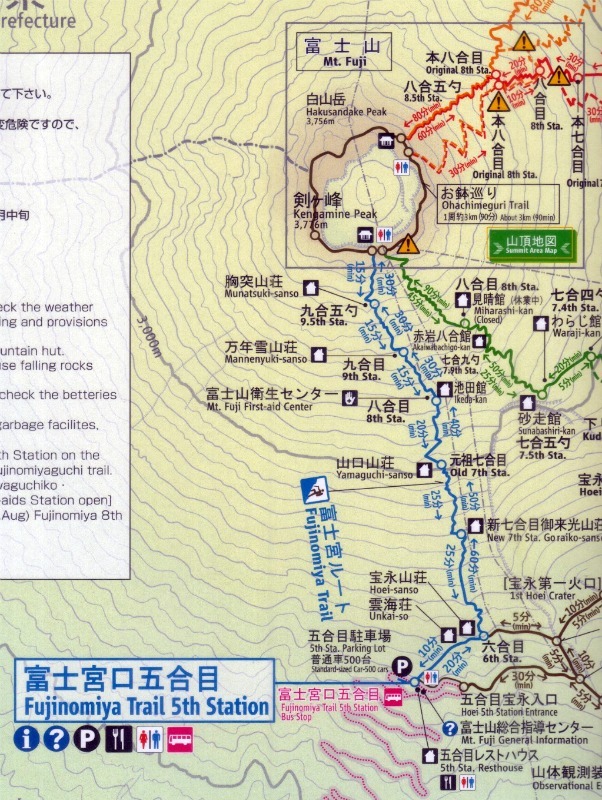 None of the 4 trails actually face west, but the Fujinomiya route (http://garywolff.com/mt_fuji_trail_maps/fujinomiya_trail_map.jpg), even though it approaches from the south, is the most western route. I would choose this one, just in case you don't make the summit before sunset. And any place on the east side of the Mt. Fuji summit cone should be a good place to see the sunrise. I'm planning to do the Fujinomiya route next month myself, but for other reasons. Its 5th Station is the highest starting point of all 4 routes, and is the shortest distance to the top. :-) It's also MUCH, MUCH less crowded than the main Kawaguchiko Yoshida route. Comments for Which trail/side of Mt Fuji is best to see the sunset and sunrise respectively? I was thinking of starting early from 5th station on the Yoshida trail to get to the summit for sunset. I was thinking of going back down to 8th station to rest then back up for sunrise. Then I realized that I can't go back down that way. In mid July, is it dangerous to stay at the summit till sunrise? Thank you so much for putting this page together! I'm very overwhelmed in planning my hike up Mt Fuji next month. I did it in 1997 with my father but we started at the 5th station. I want to start at the 1st station on the Yoshidaguchi Trail in Fujiyoshida City. I am having a hard time finding which 5th station trail this one meets up with. I need to book 2 nights on the hut since we are doing the entire trail and want to catch the sunrise. I also am having a hard time trying to figure out the trains from Narita or Haneda to Fujiyoshida City. Any information would be greatly appreciated!!! Thank you!! !